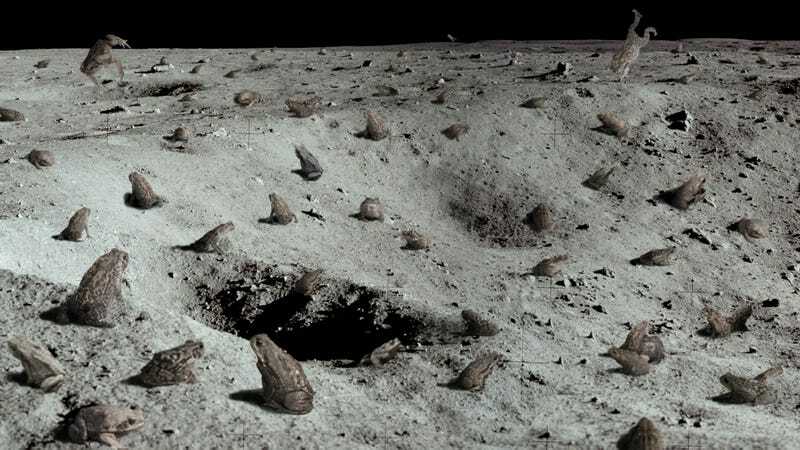 HOUSTON—Apologizing for the destruction wreaked by the invasive species, NASA announced Thursday that the Moon is now overrun with cane toads after the amphibians were accidentally introduced during the Apollo 17 mission. “Originally, cane toads were brought along by Commander Eugene Cernan as an experiment to understand how changes in gravity affect amphibian lifespans, but now they’re virtually everywhere you look on the lunar surface,” said NASA administrator Jim Bridenstine, describing how the cane toads ravaged the Moon’s ecosystem through a combination of sexual aggression, toxic chemical defenses, and a total lack of natural predators.” At this point, it’s almost impossible to tell the difference between the moon’s craters and the ditches the toads dug up for egg fertilization. Our only hope now is to keep them from spreading to Mars.” Bridenstine also detailed the administration’s plans for a 2020 lunar mission to control the cane toad population by releasing a clutch of northern water snakes.